The 4th round of the Iberian Championships hosted by Valencia this past weekend was an eventful affair with a mixture of disappointment and excitement for the Sant Vicent club. On a beautiful sunny, but breezy afternoon at Rugby City, the under 11 and under 8 teams made their second ever appearances (and first as distinct teams) on a GAA field in Spain as they faced up against the youngsters from Madrid once more. In both encounters, the progress made by the Valencia teams since the first game in Tres Cantos last month was greatly apparent with some great inter-play, individual skills and shooting on display. The Cúl Kids had clearly worked hard in the interim and have followed the direction of coaches Emma, Tom and Niamh, producing a well-structured and effective style of play. In the under 11 game in particular, the Valencia team dominated the possession and were able put together some excellent phases of play. As is mandated in under-age fixtures, scores were not recorded, but it was clear that the games were enjoyed greatly by players, parents and fans alike, so a big congratulations to the teams from both clubs and their coaches. The women’s competition more or less followed form with the Madrid Harpettes picking up their third tournament win of the year, but it was not achieved without a real battle along the way against the other four teams. 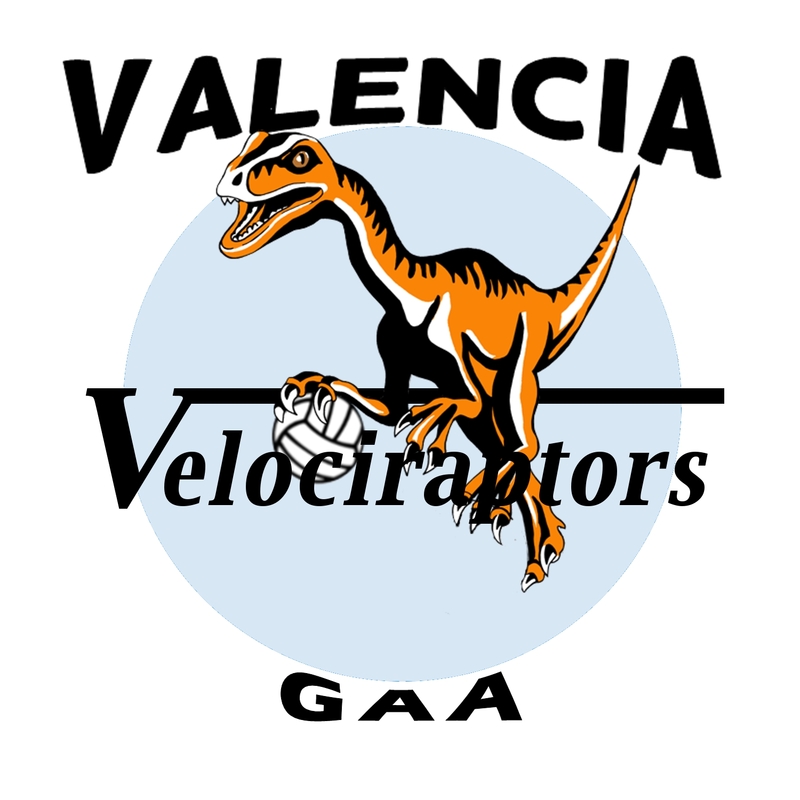 For the Valencia club, the most exciting news was the debut of a second women’s team, donned the Velociraptors, who although beaten in all four games, showed that the future is bright for women’s GAA in Valencia. Their charge was led by first-time player Laura Hoy who bagged herself 3 points in an MVP performance, while Carolina Jimenez scored the team’s first ever goal in a 3-5 to 1-2 loss to the reigning Iberian champions. For the Sant Vicent women’s team, it was all business as they worked their way through the round-robin games suffering a single defeat to Harps on their way to the final and a shot at revenge and a first-ever tournament win. Niamh Flynn continued her impressive scoring record with a tally of 2-12, while captain Emma Chan had possibly her best tournament for Valencia, notching 1-9 in what was a display of determined, calculated and intelligent play. In the highly anticipated game between the two Valencia outfits, the Sant Vicent ladies somewhat ran away with it in a 1-9 to 0-0 result, but one of the greatest positives for the day was that, between the two teams, 12 different players got on the scoresheets! In what proved to be one of the best games of the season, the women’s final saw the Harpettes and Sant Vicent ladies battle it out in a to-and-fro affair. Madrid controlled the majority of the game, but their hosts never let them pull into a comfortable lead and when Chan netted for Valencia the crowd went wild sensing a shot at history. However, the experienced Harps replied almost immediately with a second goal of their own and would ultimately cling on for a fantastic 2-7 to 1-7 victory, which means they need only show up in A Coruña to claim the title yet again. Following the regular player vote, nothing could separate the outstanding Emma C and veteran defender, Deirdre O’Driscoll meaning that they shared the Sant Vicent MVP honours. Recognition must also go to the Fillas of A Coruña who combined with Madrid O’Donnells to compete this weekend and managed their first ever win with a 0-3 to 0-2 victory over the Velociraptors. With Barcelona and Seville unable to travel on the men’s side, the fourth round was a 3-team affair with the hosts taking on A Coruña Fillos and the Harps of Madrid. Like the women, the men played in a business-like manner in the two round-robin games, recording definitive 5-9 to 0-2 and 1-7 to 1-3 victories against A Coruña and Madrid respectively, while sharing the scoring among 11 different players. The stage was then set for a final showdown between the Orange & Black and the Harps in a pivotal game in the fight for Iberian supremacy. The Harps took the wind in the first half and adhered to a solid game plan which saw them playing balls into the forward corners for their full-forwards to chase. Using the strong breeze to their advantage, they built a 3-point halftime lead. The Valencia boys had overcome a similar deficit in the earlier meeting between the two teams and entered the second stanza confident that the midfield advantage and the wind at the backs would prove decisive. Unfortunately, things didn’t go as planned, and although Freddy Nadal was able to add to his first-half goal with a couple of points, Valencia could never quite get on terms with a savvy rival. The game was sealed in the closing minutes as a free kick attempt from Andrew Pilkington came back off the Madrid bar and led to a break-away which saw the same player bring down the Harps full-forward who duly got up and slotted away the resulting penalty. Elation for the Harps and agony for Sant Vicent who know that the title is likely beyond their grasp now. Final score 1-9 to 1-5 in favour of the visitors.